This is a creation of mine from last November (2017). I had this Bratz doll for a few years now, just sitting around looking like a tart in her xmas outfit. I didn't like her that much. Her hair was matted and she looked so unloved. She was like that when I got her in a school fair. 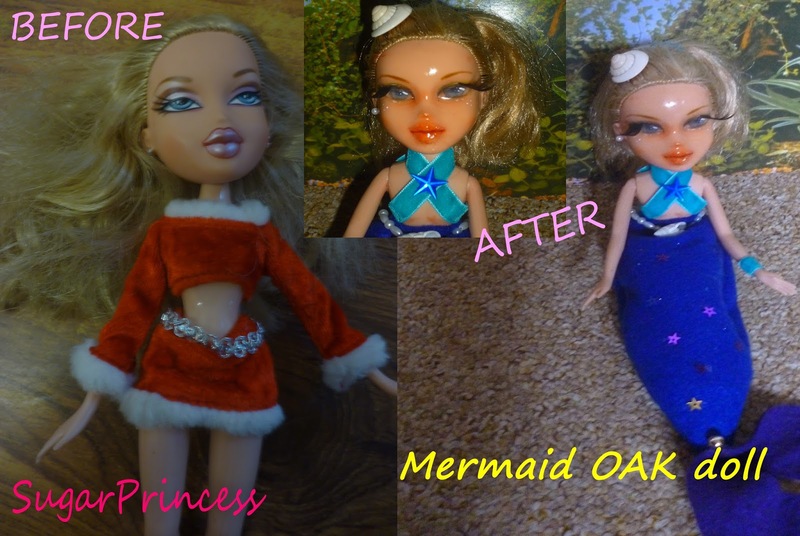 So, I decided to give her new life and turn her into a OAK doll! Firstly, I boil washed her hair. Then I removed and drew on a new face with water colour pencils. 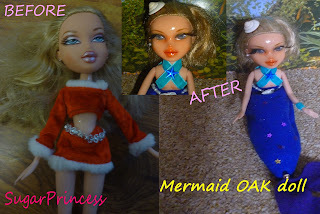 She didn't have feet, so that's why I made her into a mermaid instead of getting her new ones. She, in my opinion, looks better now. I'm not saying my work is good - I'm terrible. I'm saying that she looks more loved and happy. Until next time - see ya and love ya!